Note from Jennifer, MMT, MT-BC | Ukulele Kids Club Inc.
please join us and touch the life of a beautiful child. I just wanted to send you a quick hello and let you know how wonderful it has been to incorporate the ukuleles that you donated to CMHH. We have given two of the five ukuleles away so far and one of those kids has even brought it back for a follow up admission! Unfortunately, neither of them were willing to have a picture taken. However, we have recently started a staff ukulele choir as a way of providing some self care for the staff working with kids. The staff performed all around the hospital earlier this week. Some of the donated ukuleles were lent out to staff members who do not yet own their own for the performance. The staff really got a lot out of playing for the kids and other staff at the hospital. New relationships were formed between patients and nurses (they thought it was sooo cool to see their nurse playing the uke!) Thank you for all you do! Ukulele Kids Club Inc. is a gold-level GuideStar participant, demonstrating our commitment to transparency. 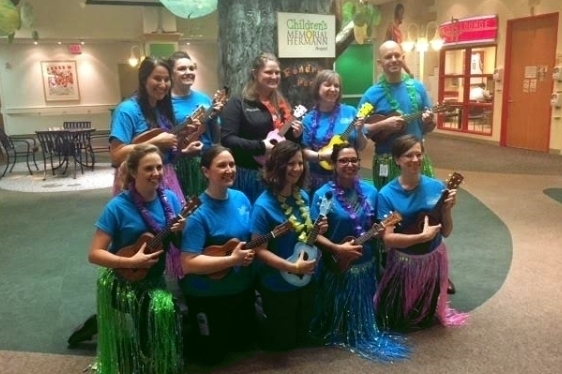 To date, more than 7,000 ukuleles have been gifted to hospitalized children.